You can super size your memory to make it more like that of a world champion, according to scientists. Scans reveal that while memory champions' brains are nothing special in terms of anatomy, they do show changes in brain connectivity. What's more, neuroscientists were able to train people with ordinary memory skills to emulate the masters. The learners could remember lists of names at a time and showed similar brain connectivity patterns. "A good memory is something you could learn and you could train (for)," said lead researcher, Dr Martin Dresler, of Radboud University Medical Centre in Nijmegen, The Netherlands. "And if you use these strategic mnemonic training memory strategies you can really considerably increase your memory, even if you have a very bad memory at the start." The findings , based on brain scans of 23 world memory champions, are published in the scientific journal, Neuron. They are based on mnemonics, memory devices that help you recall lots of information, especially in the form of lists. Techniques include loci, or memory palace, an ancient method where you make an imaginary journey through a place you know well, such as a building, using each location as a visual prompt to store information. Neuroscientists studied the brains of memory champions, who excel at memorising vast quantities of information, from playing cards to names and faces. They scanned their brains using functional magnetic resonance imaging (fMRI), which measures brain activity by detecting blood flow changes. They then compared their brains with those of people of a similar age who had similar IQs. The researchers found subtle differences in connectivity patterns across a large number of brain regions. However, no single region stood out. "There we learned that neurobiological differences between these world class memory champions and more or less normal control subjects appear to be quite widespread, distributed and subtle," Dr Dresler explained. The scientists then trained people with typical memory skills to see if they could improve. Some were given training in techniques used by memory athletes, others had memory training that did not include mnemonic strategies, while the rest had no training at all. After six weeks of training for 30 minutes a day, the subjects all had another brain scan. The researchers saw a big increase in memory powers for those given training used by memory athletes. They went from recalling an average of 26 to 30 words from a list of 72 to remembering more than 60. This group also showed changes in brain connectivity. "In a sense they really develop brain patterns that remind us of those of memory athletes," said Dr Dresler. "This specific pattern in brain connectivity appears to be the neurobiological basis of these increased and superior memory performances." 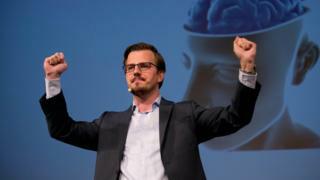 Neuroscientist Dr Boris Nikolai Konrad had his own brain scanned for the research and trained the novices. He holds two world records for memorising hundreds of words, and names and faces, in a short time and is also listed in the Guinness Book of World Records. Despite this, he says he wasn't born with exceptional memory skills. "In school, I nearly failed because I couldn't remember English vocabulary," he told BBC News. "It took me a while to realise that there's something that helps me in memorising, particularly these memory techniques. "I really love sharing this idea that you can improve your memory because I still don't know why we don't teach this to kids, to people, much more, because in my opinion it is really useful." Prof Michael Anderson of the department of neuroscience at the University of Cambridge, who is not connected with the research, said we have known about the power of such methods since the time of the ancient Greeks. "Dresler and Konrad have not only elegantly illustrated how readily this superior memorisation ability can be trained, but also have taken the important step of identifying the changes in the brain that accompany it," he said. But he said the benefits of the training are likely to be restricted to cases in which people consciously apply the trained strategy. Thus, "it remains to be seen whether people experience global improvements in everyday memory".